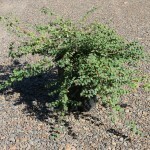 A low growing, spreading shrub, with arching stems. Small pink, bell shaped flowers appear along the stems in summer. Coral-pink berries follow in the fall. It is a widely adaptable plant, useful in mass planting, along banks, or as a groundcover. It grows in full sun to shade and moderately wet to dry soils.